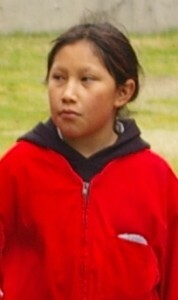 On the afternoon of Saturday, May 19, we were called to Helliwell Park. We arrived on scene at the bluffs to find a motionless patient at the bottom of an overhanging 15-20 meter cliff. While we rigged our rope systems to get our team to the patient, two civilian first aiders were able to get to the patient from the water via private boats. They found the patient unresponsive, with no pulse and began CPR. The Canadian Coast Guard was dispatched from French Creek and arrived just after the Fire Department team got to the patient. The rescuers at the bottom of the bluffs, with a belay from the team at the top, were able to transfer the patient to the Coast Guard boat on which she was transported to Tribune Bay to the waiting Air Ambulance crew. Sadly, the rescuers were never able to restore a pulse despite administration of CPR and the use of an automated external defibrillator. Witnesses say that she had been walking to the lookout near the edge of the cliff when she appeared to bend over to pick something up and fell over the edge. Our thoughts and hearts go out to friends and family affected by this tragic accident. HIFR is very appreciative of the help given by the two responders from Bowser, the impressive response from the Coast Guard and BC Air Ambulance, and the coordination from the RCMP. Pat has a new blog entry where he, somehow, is able to talk about backwards underwear, a 2AM ferry ride, and dog bites. Check it out. Hornby Island Fire Rescue, along with many other community members, has been involved in an intense ground search for Orlando Graham. The RCMP, 442 Squadron from CFB Comox, Canadian Coast Guard. the Rescue Coordination Center in Victoria, Comox Valley Ground Search and Rescue, and many other Search and Rescue (SAR) groups from Campbell River to Cowichan, have been searching the water and land since Wednesday night. At times there were upwards of 75 people working within the organized search plan and countless others searching on their own. The response from the Hornby Island community has been every bit as generous as we’ve come to expect. The various SAR teams have been astounded by how well our island has looked after them and supported their efforts. We’re extremely proud of our island and particularly proud of our Fire Department. Our members absolutely shone in their assigned tasks, demonstrating professionalism, passion, and dedication to the job. We can’t thank enough everyone who helped out, but there were some standouts. Valerie Pagnier came 4 times with batches of fresh baking and Mia Wood made lunch for 40 people. Rachelle Chinnery and Theresa Hamilton did a search detail, then worked the rest of Thursday and Friday coordinating food and coffee. Ian Emberton took time away from the new twins to transport food and to make a batch of cookies. Many other Islanders patiently waited to be assigned a search team and then diligently carried out their task. Wilson Curry worked tirelessly all Thursday doing several search details. Then at the end of the day slipped on a rock and badly sprained his ankle. We wish him a speedy recovery and thank him for his hard work. At this time the command structure of all of the involved organizations agree that any location where Orlando would be if he was injured or needing help has been exhaustively searched by both people and 4 dog teams. There is, however, no conclusive evidence to indicate what has happened to him. Please have a good look in any of your outbuildings, cabins, or structures. The off island SAR teams have left and aren’t expected to return unless additional information or clues emerge. The RCMP will continue to comb the coastline from the water as well as exploring other investigative avenues. The Fire Department has stood down but is ready to start it all over again if something comes up. All of our members, as well as the community at large, are extremely saddened by Orlando’s disappearance. Our hearts go out to Veronica, Renaud, and the rest of Orlando’s family. If you have any concerns or questions about the search please contact Doug at 218-9156 or Giff at 335.1115. We are happy to provide any information that we can. Pat was along for the beach fire at Helliwell and seems to have had a good time. Read his latest ‘blog entry. On April 3 at about 1500 Denman Island Fire Department received a page to assist BC Ambulance in rescuing a patient from Boyle Point Park. As the call progressed it was becoming obvious that it was not a simple wildland extrication. The patient was at the bottom of a cliff on a particularly rugged piece of coastline. 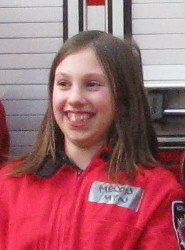 Denman Fire had begun to lower one of their members down the cliff while several others made their way along the coastline. Hornby Island Fire Rescue offered our assistance in the form of a boat to extricate the patient and Denman accepted that offer. Two members of HIFR left Ford Cove Marina at 1600 and arrived at the scene on Denman at approximately 1610. Deputy Chinnery and firefighter Alan Friesen of DIVFD arrived at the patient’s side at the same time. The two were able to assess her injuries and get her aboard Captain Zielinski’s boat. DIVFD’s Deputy, Rob Manering, arrived on scene and also came on board to assist with patient transport. We were met at Gravelly Bay by BC Ambulance who took charge of the patient. HIFR would like to congratulate DIVFD on a successful and well run incident. It was a pleasure working with them and we look forward to the next chance to work together. On Sunday, March 6 at 1800 we received a general page for a fire on Little Trib beach. We arrived to find a soggy and barely smoldering fire all but extinguished. Further investigation revealed that the bonfire had extended to the dead grasses at the head of the beach, but that had also been extinguished. As it turns out, a large fire had been left unattended at the head of the beach and in front of a local residence. Soledad and Breanna, two of our recent Cadet Camp graduates came across the fire on their way home and immediately realized the hazard. While one of them found a bucket the other called an adult and initiated a fire department response. Using skills that they learned in Cadet Camp, they safely and successfully knocked down the 1.5 -2 meter flames before the fire could extend to the brush between the beach and the houses. HIFR would like to thank Breanna and Soledad for their sharp thinking and quick action in helping us deal with a potentially dangerous situation. Our training tells us that fire ground is a dynamic place. Conditions change so we adjust our tactics to suit. Road conditions on Thurday night’s practice enforced that by having us scrambling to adjust our plans. Initially we were to do a structural fire scenario at the recycling depot. At the time of practice the road to the depot still hadn’t been plowed. Although we could have safely gotten the trucks up the hill, we were concerned about getting them back down. In the event of an actual fire we would have gone, but it seemed unwise to risk close to a million dollars worth of equipment for the sake of a practice. The firehall benefited from this change as we put the firefighters to work taking care of the chores that had been stacking up lately. We were able to make it an early night and will return to tackle the depot scenario another day. In our feature, The Rookie’s Blog, our new recruit, Patrick Lui tells us about his first callout. We’ve now been to 2 chimney fires in under a month. Fortunately no one was hurt and no property was damaged. There was a common theme to both of our calls that is worth mentioning. 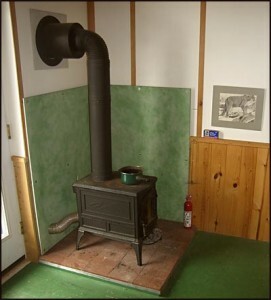 That theme is a wood stove connected to a chimney with a horizontal pipe. Any horizontal surface will collect stuff, whether it’s knick-knacks on a kitchen shelf or creosote in a chimney. It seems that in both cases the fire started near to the joint where the horizontal component of the stovepipe connected to the main chimney. The good news is that usually this stovepipe is relatively easy to clean. The bad news is that it is often forgotten when the rest of the chimney is cleaned. If you have one of these setups, make sure that the elbows out of the wood stove get taken apart and thoroughly cleaned as part of your regular cleaning schedule. Also, if you have this type of setup, you will want to clean out the stove pipe more often than those with a strictly vertical chimney system. If you should discover a chimney fire, throw 1 cup of water into the firebox, close the door and the damper on the stove. Then call 911, and leave the house. One cup of water will expand to 1500 cups of steam which can go a long way to cooling the fire without damaging the flue. At 1PM on Christmas Eve we got a Duty Officer call reporting trees down across the power lines to the Recycling Depot. The Deputy and the Chief arrived on scene to find 2 trees had blown over, taken out the hydro lines and were blocking the road. Sixteen cars and their passengers were trapped at the Depot unable to escape. After determining that the power lines were dead, we limbed and cut the trees to create a slot large enough for a car to drive through. Stani, the Depot manager, used the back hoe to move the cut logs and all of the trapped people were able to leave. Christmas was saved! 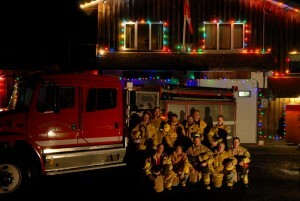 From all of us at Hornby Island Fire Rescue, have a great Christmas, and we hope you all have a prosperous and fulfilling New Year. Be safe and drive carefully. 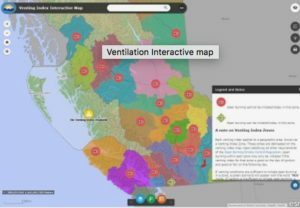 Call the fire hall at 250.335.2611 to get a permit.